setting, tastefully decorated, located on the tip of Indian Pass. saltwater makes one the most fertile estuarine areas of the world. civilization has conveniently skipped us over. privacy in a natural setting just steps (150 ft.) from the beach. There is an outdoor shower on the deck. The Barnacle does not have a direct beach view from the house because of a 30' high heavily vegetated sand dune between the houses and the beach. 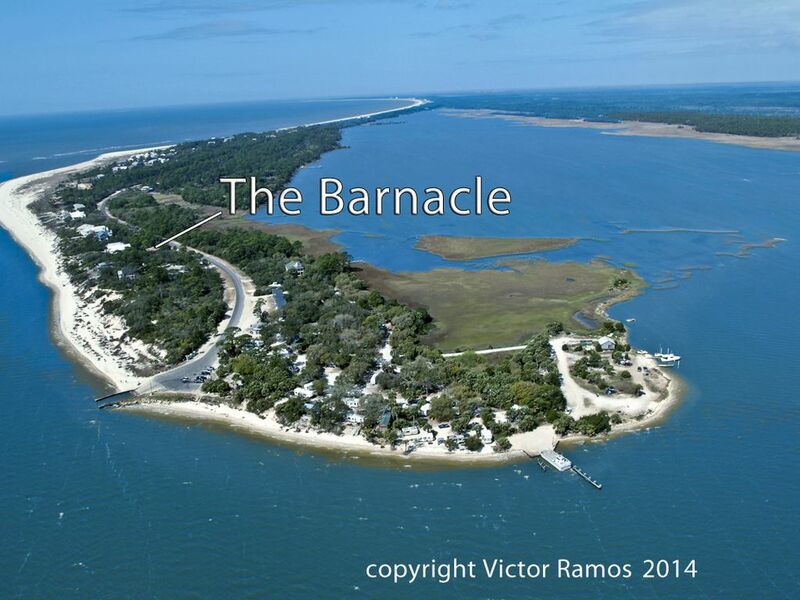 Please check the aerial view for the "lay of the land"
The Barnacle is in a park-like setting-- many trees and wildlife. The beach is accessed by a private boardwalk going up and over the sand dune, curving through oak trees. View is from the boardwalk. The path to the beach takes less than a minute to walk up and over the private boardwalk to the beach. We provide one sheet set for each of the queen beds, as well as the queen sleeper sofa. A comforter/bedspread and blankets are also provided. A washer and dryer are downstairs for your use, however we do not provide the laundry detergent. A clothes dryer is provided downstairs. We have parking for two vehicles. Any additional ones will have to be parked in front of The Barnacle on the street. Please ask before bringing a boat. Free and wireless, however we are not responsible should the system go offline. We depend on the internet, as well, and make every effort to keep it up and running. We provide at least one towel set for each of our guests per stay. We provide a washer and dryer for you to keep them clean as needed. There are also a few beach towels for the beach. The living room has a wide-screen TV and library with a built in desk. We have a Mr. Coffee machine for regular brew, and a Kuerig. Our dining room table is small, but comfortably seats 4. We have two extra dining room chairs that may be pulled up to the table, and a large coffee table in the living room. Our cable service is quite good, however, we cannot be responsible should it go out of service. We will make every effort to get it up and running again, though. Many books and magazines in the library, as well as a public library in Port St. Joe. We have a few board games for your enjoyment. Please be sure ALL game pieces are returned to the box for the next players. Several places from which to rent. Some will even deliver to the Barnacle. May bring your own. Check out Scallop Cove and Happy Hours on the Cape. Beach bikes may be borrowed from the Barnacle, however, they must be rinsed off, if taken on the beach. Pontoon boat rentals available in Port St. Joe at the marina. Other smaller boats may be rented at Presnell's Marina. The deck goes around the whole house. The house is up on pilings, so one would have to be able to use stairs. There are also stairs on the boardwalk to get to the beach. Our cottage is very well appointed including, central heat and air, glass top stove with microwave, toaster, coffeemaker, blender, full complement of dishes and pots and pans and ice maker. Built-in library has a large assortment of books, cable TV, DVD player, free wireless DSL, four adult beach bikes, beach chairs, washer-dryer and linens are all included in our fee. Nice and quiet out on Indian Pass at the Barnacle. The beaches were beautiful and the again, very few people! The house itself was really neat, well equipped, and we found the beds to actually be comfortable. Usually... that’s our biggest problem. I think what really capped off the stay was how easy and a pleasure it was with the owners. Communication with Janis was great and it’s always good when the administration and what not of a trip is easy and it feels like you’re talking to a great next door neighbor! Also.. Indian Pass Raw Bar was amazing!!! Get there early. Thanks to Ramos’ for making this a quality trip for rest and relaxation! Truly idyllic! We had the beach to ourselves and loved the house. Victor and Janis are wonderful hosts. Helped us find a tire shop in our way when we blew both boat trailer tires. Lovely setting and amenities. Can’t wait to go back! We were so happy to have been able to help you while you were out on the road and just glad you made it here safely and had a good time! Thank you so much! We are looking forward to your return! The Barnacle may be the most well maintained and immaculate vacation rental I've stayed in! The setting of this cozy cottage was a little different from other typical beach places; it is just off the beach ( though easily accessed by a short private boardwalk) and surrounded by foliage and wildlife so that you get the feeling of being in a really nice treehouse. We absolutely loved the birds and squirrels that visited every morning. The owners provide birdseed and one little squirrel happily ate from my hand! Victor and Janis, the owners, were extremely welcoming and willing to help with any questions. We enjoyed our stay at The Barnacle! Thank you so much for taking the time to review The Barnacle! We loved having you here! Our housekeeper takes her time cleaning The Barnacle, and will be very happy to hear her work is being noticed in such a positive way. The wildlife is one of our special gifts here on Indian Pass, and we love it when our guests are as excited about seeing it as we are. Please come back and visit us again! It has been a pleasure!! It was clean, and nicely stocked with the necessities. perfect location! Very quiet and relaxing. Awesome beach! The rental was very clean and up to date. Very comfortable. Lots of wildlife to see from deck. The eagles were beautiful. Thank you for your nice review! We appreciate you noticing how up-to-date we keep The Barnacle. We feel it's important to us, as well as our guests. Victor and I would love to have you back for a return visit, so please come and see us again! Excellent choice for a restful vacation in a tastefully decorated house. We really enjoyed our stay in The Barnacle. The place is very nice and tastefully decorated. The kitchen was very well stocked with pans, dishes, etc. They even had the added bonus of daily "entertainment" of local birds and squirrels that visit the balcony. We really enjoyed watching them. This house is located very close to the beach and also to one of our favorite restaurants - Indian Pass Raw Bar. Probably the best aspect was the friendliness of our hosts Janis and Victor. They could easily be contacted to answer questions and very prompt in responding to our emails prior to our arrival. We hope to go back again. Thank you so much for your review! We really enjoyed having you all here, as well, and so happy you had a nice time! Please come back and see us again. Victor and I will look forward to your visit! All the best for a good summer! and listening to the sounds of nature. Writers love it here for its seclusion and serene setting. Nightly Rate: $175 - $200 Weekly Rate: $1200 - $1400 Monthly Rate: Please note that we do not accept monthly bookings/rates. PayPal: All PayPal fees are the responsibility of the renter. Refundable $300.00 security deposit applies to all bookings. Saturday is the "turn" day for the Barnacle from April through September, and can only be rented weekly during those busy months. We offer a full refund if a guest has to cancel, at least 60 days before arrival. If a cancellation is after the 60 days, a full refund, minus $25.00 processing fee, will be given, provided those days can be re-booked. We are not able to offer refunds if the cancellation is less than 60 days. Hurricanes: If Indian Pass is under mandatory evacuation, any unused portion of the fee will be refunded. We suggest purchasing traveler's insurance, for those unexpected events that would prevent you from keeping your reservation.